It was my own health issues that led me to study nutrition. After 15 years of suffering an assortment of health imbalances (thyroid nodules, infertility, chronic diarrhea, endometriosis, poor sleep, increased weight and general lack of energy) I had become frustrated and started looking for answers. After a doctor’s visit that left me with a prescription in one hand but no real answers to my symptoms, I set out to explore the root causes of my ailments. Through acupuncture, nutrition and lifestyle changes I was able to reverse most all of my symptoms, restore digestive health and have more energy than I had for years. I discovered the power of nutrient dense whole foods and the importance of true self-care. It is my mission to help my clients prioritize their own health and healing through nutrition and lifestyle shifts so that they can discover just how amazing they can feel. I am a Nutritional Therapy Practitioner (NTP), certified by the Nutritional Therapy Association and work with clients to reach their health goals. I recognize and value that we are all bio-individuals and that one way of eating may work for some but not others. There is no one size fits all or quick fix solution. Through a variety of assessment tools I am able to find what works best for your body and your lifestyle. I work individually with clients, teach RESTART classes and offer Nutritional Therapy support for families. 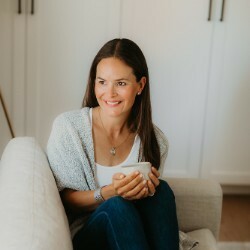 I am a busy mom of three myself, so helping other parents to better nourish themselves and their families is something I love being able to do. My family and I have lived in Lafayette for 12 years and all 3 of my kids are currently at Stanley Middle School. In addition to my passion of helping others to reach their health goals, I love cooking, visiting local farmer’s markets, connecting with friends and hiking with my black lab, Rosie.